Lee Smith published her first novel The Last Day the Dogbushes Bloomed forty-seven years ago. Since, she has published thirteen novels—more than one making the NYT bestsellers list—and four collections of short fiction. 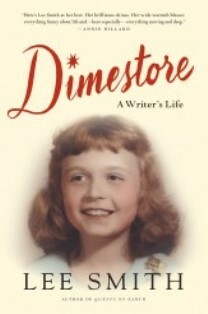 The fifteen concise, artful essays in Dimestore are her first book-length collection of nonfiction, and the glimpses they give us into her life, the writing process, and the American South are in turn artful and funny, poignant and prophetic. As Eudora Welty established in her iconic Southern writer’s memoir, One Writer’s Beginnings, a beloved author’s memoir must tell how the writer’s early life shaped the art. Smith’s descriptions of her large extended family and her father’s Ben Franklin store in Grundy, Virginia, capture the 1950s in the small town South. Her mother—like so many mothers of that era—clearly thought her daughter would grow up to be “a lady,” but as Smith describes herself, “I would grow up wild and marry young.” On the road to that first marriage came four years at Hollins College where a nineteen-year-old Smith heard Eudora Welty read “A Worn Path,” bringing writing alive in Smith’s mind, though by her own admission she was more conscious at the time of the visiting males sitting in the back of the room. The other literary influence Smith pays tribute to in this essay, “Marble Cake and Moonshine,” is James Still whose work led Smith to the Hindman Settlement School and the Appalachian Writers Workshop. In nonfiction as in fiction, Smith creates unforgettable characters. When she is sent south for “lady lessons” to Birmingham to visit her Aunt Gay-Gay, “whose two specialties were Rising to the Occasion and Rising Above It All, whatever ‘it’ happened to be,” she witnesses her aunt’s love of gin and tonics, Aunt Gay-Gay sometimes getting her husband to start them early by saying, “Pour me one, honey, it’s already dark underneath the house.” Smith’s remembrances of covering a majorette contest for The Tuscaloosa News is in perfect pitch. Anita Miller Garner is professor of English and Creative Writing in the graduate program in Professional Writing at the University of North Alabama.